There are many types of valve actuators, with solenoid pilot actuators being one of them. This page provides information about what they are, how they work, and how to apply this information to a valve selection. A solenoid pilot valve actuator is a device that is used to operate larger compressed air valves. There are pages on this site about direct acting solenoid valve actuators. In those pages I discussed how it is impractical to use a direct acting solenoid to actuate larger compressed air valves, due to the relative low valve shifting force of a direct acting coil. With a small distance (10th of an inch or so) a direct acting coil generates sufficient force. Longer than that, there may not be enough shifting force to work the air valve reliably. If longer distances are required to shift the valve poppet or spool, as they are in the operation of all larger air valves, the direct acting coil cannot be used as it does not have enough power to shift the valve mechanism what is a long distance in terms of valve operation. Use Electricity To Operate Big Valves? If a direct acting solenoid cannot be used to shift the poppet or spool in a larger air valve, how do we use an electrical solenoid coil to shift the internal mechanism of larger compressed air valves, then? That is where the solenoid pilot valve actuator comes in. For small valves with low shifting distances the direct acting solenoid valve actuator does work well. With reasonable quality compressed air flowing through it, direct acting solenoids (and the small valves they actuate) can be relied on for millions of cycles with little or no problem. They are the right product for the right job. What is it that the small, direct acting solenoid air valve controls? Compressed air, of course. 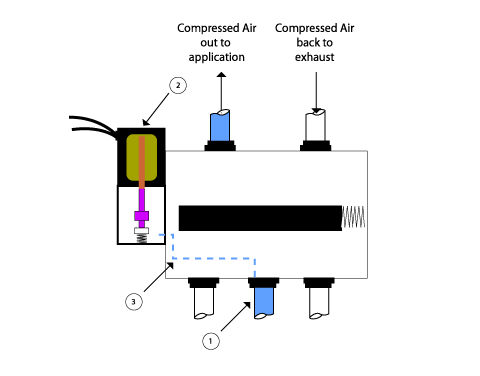 And why do we use compressed air to do work? Because, compressed air is able to exert a significantly greater force than many other energy sources. What is it that we need to shift the internal workings of larger air valves? Higher force. In fact, the valve mechanism requires enough force to ensure that the valve poppet or spool will shift reliably against friction, sometimes air borne debris, changing conditions with the valve, yet the valve is expected to work when required to. Why not harness compressed air to move the spool in larger air valves? A Solenoid Pilot Uses Compressed Air To Shift The Valve! Then, why not use a small, relatively (for its size) powerful and reliable small direct acting solenoid valve to solenoid pilot-operate a larger valve? And of course, industry does. In the drawing I show a small, direct acting solenoid valve, installed on the end of a much larger spool valve, item #2. Item #3 shows the supply line of compressed air to that small, direct acting solenoid valve. 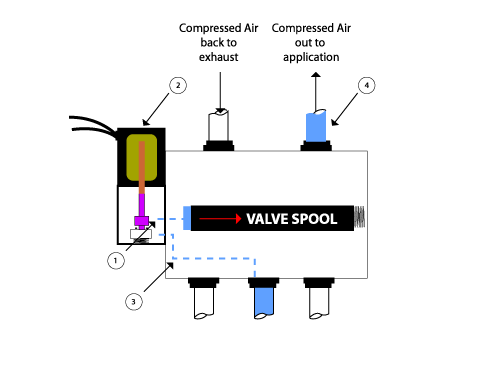 The supply of air to the small valve is taken internally from the main valves compressed air supply (item #2). In the drawing, the small direct acting valve is drawn as de-energized. As a result, the main, larger valve is in it’s resting position. The spool is to the left, and the internal main valve actuator, the spring, is extended. For simplicity, I chose not to try to show the flow paths in the main valve, or those in the small direct acting valve. Inside the larger air valve will be a spool or a poppet. The end of that spool or poppet will be as big as the valve body will allow. When we are talking about power; Force = Pressure x Area. With compressed air force measured in PSI. In this drawing, item #2, the direct acting solenoid pilot valve, has now been energized. The pilot air (item #3) which had been flowing to the direct acting solenoid pilot valve is now flowing through it (item #1) and filling the area in front of the valve spool. This pilot air is pushing on the end of the spool similar what happens to a piston in an air cylinder. Since the air is trapped there, it builds pressure and exerts force on the end of the spool. When that force becomes great enough, the spool will be shifted over against the internal spring, and the flow paths through the main valve will change. This all happens in a fraction of a second.